Renault karnavai Parklane Auto Pvt. Ltd.
Note- We mainly deals in Ahmedabad region. 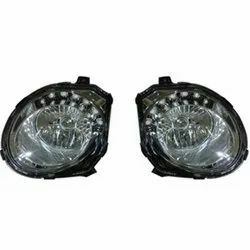 Leader in Automotive lighting Head Lamps, Work Lamps, LED Lamps, Fog Lamps, Turn Signal Lamps, Halogen Bulbs, and Incandescent Bulbs & Miniature Bulbs. We are engaged in offering a superb quality gamut of automobile Head Lamps, which is perfect to be used in many vehicles. This range provides clear visibility of path and assists the driver in convenient driving. We offer it in versatile designs and specification for the clients. Our range is appreciated by many customers for its reliability, harsh weather withstanding capacity and durability. The LEDs, used as daytime running lights, also combine with the Bi-Xenon Curve Projector headlights to create a striking presence for the new Yeti. Increased light output and natural white colour of Xenon light (for low and high beam) causes less fatigue in low light conditions.